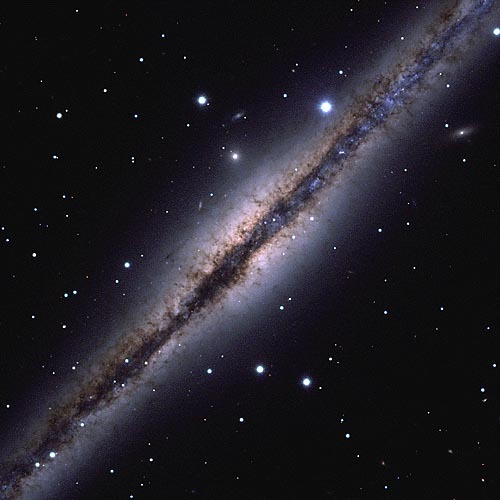 Explanation: What is going on in NGC 891? This galaxy appeared previously to be very similar to our own Milky Way Galaxy: a spiral galaxy seen nearly edge-on. However, recent high-resolution images of NGC 891's dust show unusual filamentary patterns extending well away from its Galactic disk. This interstellar dust was probably thrown out of the galactic disk toward the halo by stellar supernovae explosions. Because dust is so fragile, its appearance after surviving disk expulsion can be very telling. Newly discovered phenomena, however, sometimes appear so complex that more questions are raised than are answered.